Time is always the problem It’s the also the best revision tool in the shed, but let’s set aside the problem as I understood it back then, as a novel idea was being born. This is the first evidence I have for what has become Under a Dark Sky, a murder mystery set in a dark sky park and my fourth novel. It’s possible I had heard about dark sky parks prior to that—I have a bookmarked article from 2011 about the Headlands International Dark Sky Park, which is the model I used to write the novel. I do know that when I first learned about that designation—“dark sky park”—I knew it would make a great setting for a murder mystery. No offense to the parks. I’m sure they’re also great for picnics and hiking. But if you put that phrase “dark sky” in front of anything, the little sensor in my crime writer’s brain whoop-whoops to life. I was not in the position to drop everything and write the dark sky book. I had another book to finish first, so the idea stayed a twinkle in my eye for quite a while. When I was ready to write the story, I was not in the position to travel to the park I wanted to write about—the devil Time, again, and then Winter, which keeps most sane Chicagoans in their homes and not driving five hours around the giant frozen pond of Lake Michigan to have outdoor fun. In short: I had to figure out ways to write about the park before I had been there. This was not my preferred method of research. I had chosen a unique location and devised the story from that one point on the map—and then I couldn’t get there. Irony of the worst sort. So instead I had to rely on online tools until I could finally make the trip. First problem: What did a dark sky park look like? Photos shared online! What does the park look like from a bird’s eye view? I bought this map. When I saw “Rent the Guesthouse,” I knew I had an inciting incident for this novel. What if you thought you were renting the whole place but instead had a room in a house with a lot of strangers? One of which will be dead by dawn? What does it look like on that shoreline there? More photos. And then I discovered the Discovery Trail. Those cut-outs! I had to have them. Later in the story, my characters needed to go to the hospital, but that’s across the Mackinac Bridge. Hmm. What’s it like to ride over the Mighty Mac? Answer: YouTube Video. My character is afraid of the dark. Luckily, the days are long up north in the Petoskey area. I had to keep the sunset times in mind, though. Such long days to fill! Characters can get up to a lot of no good in such long, languid days. 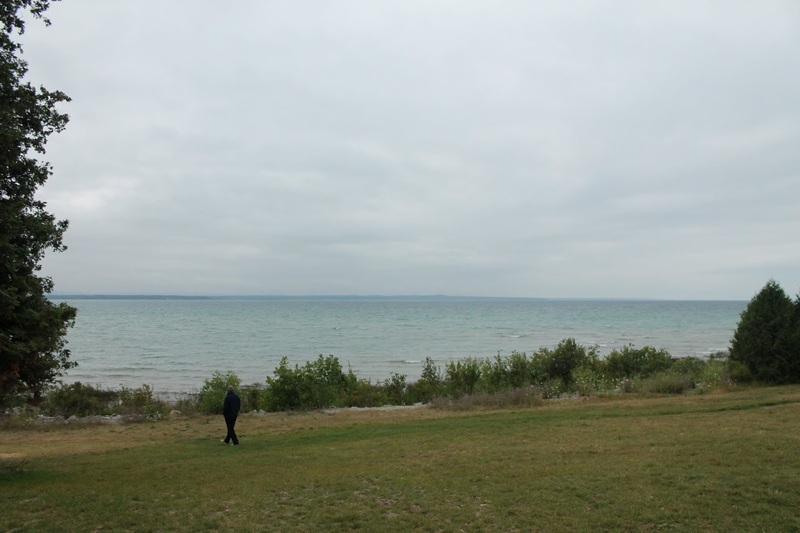 The good news is that I did finally get a chance to visit Mackinaw City, to drive over that crazy bridge, to visit Mackinac Island AND the divine Grand Hotel, which also features in the book, and to walk around the very dark sky park I had been writing about all this time, the Headlands International Dark Sky Park. Even better news: I’m going back, to talk about Under a Dark Sky. The Headlands don’t seem to mind that I turned their lovely park into a fictional crime scene (whew! ), and in fact are embracing it, selling copies in their brand new gift shop. It’s been a long road since I had the very first inkling of this idea, and some of my writing students and friends have been with me the entire way. I’m so glad to get to share this book, and have been really excited by how many people have said they can’t wait to visit a dark sky park themselves. More visitors to the parks may lead to more visibility which should mean more protected skies, and more protectors. And that is a very bright ending to a story about the dark. Under a Dark Sky now is on sale now. Start reading an excerpt and follow Lori Rader-Day on Facebook, Twitter, and Instagram.